We are a thriving Liberal Jewish community with a synagogue just outside Kingston-upon-Thames, South West London. As a congregation affiliated to Liberal Judaism, our strong sense of Jewish tradition is coupled with a progressive, modern outlook. Our members come from a variety of Jewish backgrounds and this creates the dynamic, inclusive atmosphere we’re so proud of. KLS was formed in April 1967 with just 50 families. Before we had our own synagogue, we met regularly for services at the Quaker meeting rooms in Kingston. In 1976 we moved to Rushett Road which has been our home now for over 40 years. In this time we have grown to a membership of several hundred people and our building has recently enjoyed a major facelift. 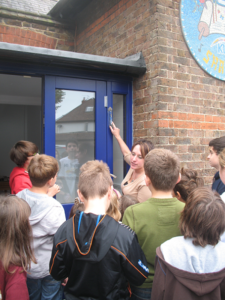 KLS is a vibrant, happy community, actively celebrating Judaism in a progressive context. We rely on our members’ energy and efforts to run the day-to-day life of the synagogue and to sit on our elected council and committees. As a community we are dedicated to meeting the spiritual, cultural, educational and social needs of our members. We are proud members of Liberal Judaism, which identifies itself as the forward-looking edge of Judaism, while reverencing tradition and seeking to preserve all that is good in the Judaism of the past. Our congregation is led by Rabbi René Pfertzel. René takes most of our services, is Principal of the religion school and also runs our adult education programme. We are also proud to have as our Rabbi Emeritus, Rabbi Danny Rich, who was Kingston Liberal Synagogue’s first full-time rabbi, from 1988 to 2004. Danny is now Chief Executive of Liberal Judaism. We are a registered charity and manage our affairs according to principles of good practice outlined by the UK Charity Commissioners. Ongoing management is undertaken by an elected Council, guided by a written constitution and reporting to general meetings of the membership. State-of-the-art kitchen – offers full catering facilities for kiddushim, functions and socials. Kingston Liberal Synagogue uses three “rescued” Czech Torah Scrolls. These scrolls were part of a collection of ritual objects intended for confiscation by the Nazis from the destroyed Jewish communities of Bohemia, Moravia and Slovakia. After the defeat of the Nazis the scrolls were stored in an old synagogue in Prague. Eventually their existence became known; the Memorial Scrolls Trust was formed to purchase them and bring them to Westminster Synagogue in 1964. More information on Czech scrolls. KLS has scrolls from Blatna, Rychnov and Tabor, towns now within the Czech Republic. The scrolls are a precious heritage; by using them we honour the memory of their vanished communities. Our Ner Tamid was a gift from a founder member, in memory of her parents who perished in the Holocaust. It was commissioned from a well-known Israeli artist and sculptor, and features a design of petals symbolically encircled with barbed wire.